Father Christmas--An Anthropomorphic Fly Agaric Mushroom? Perceptive people have associated St. Nicholas with the fly agaric mushroom that, in former times, was eaten during the winter solstice in northern Europe--and which made it possible to fly through other worlds. 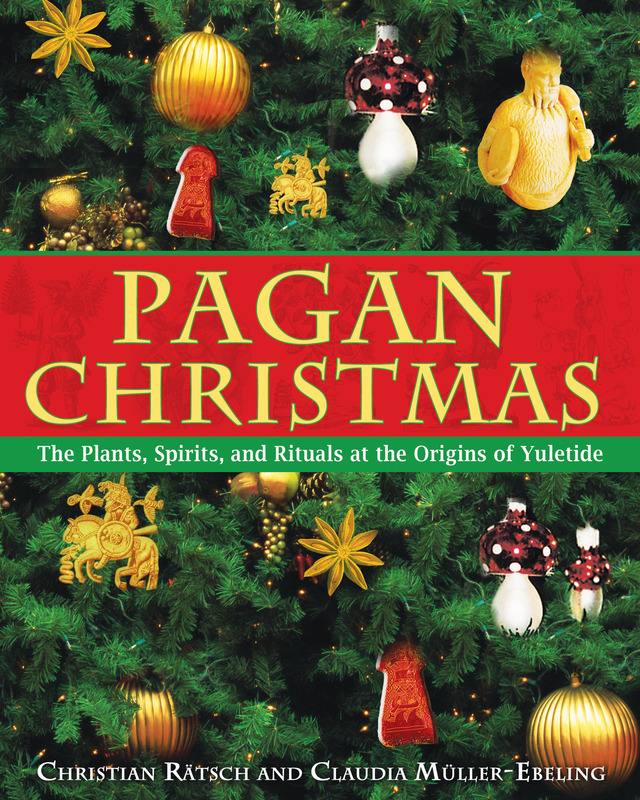 Many aspects of modern Christmas rituals have their origin in pagan customs. At close inspection, even the red-and-white dressed Father Christmas can be seen as another version of Wotan or as a secret shaman. But most astonishingly, he might even be seen as an anthropomorphic fly agaric mushroom! A scandalous claim? Perhaps. But first, let us look more closely at his connection with the shamanic fly agaric mushroom. The characteristic red mushroom with its white dots is the Nordic shamanic drug par excellence. Most shamans of the Northern Hemisphere ate it ritually. Its shamanic use can be traced to the Lapps, the Siberian nomadic peoples (Samojeden, Ostjaken, Tungusen, and Jakuten), and the North American Indians. Old Nordic Shamanism was associated closely with Odin (Wotan) and resembled the shamanism of the Lapps and the ancient Finnish peoples. In many mythologies, storm and thunderstorm gods are associated with the fly agaric mushroom, perhaps because the thunder and lightning of the outer world can be triggered by the agaric mushroom flight through the inner world. The Germanic thunder and fertility god, Donar or Thor, drives his goat cart through the air. He causes thunder and lightning when he throws his hammer in the clouds. Then thunderstones (meteorites) begin falling and hitting the earth. Where they inseminate the ground, mushrooms grow, especially fly agarics. Mythology recorded in modern times contains some stories in which Wotan (Wodan or Odin), the shamanic god of ecstasy and knowledge, was associated with the fly agaric mushroom. According to legend, the fly agaric mushroom grows where Wotan rides on his horse through the clouds with his followers, the members of the wild hunt, in the dark nights around the time of the winter solstice. Wherever the froth of Wotan’s horse fell to the ground, the ground would become “pregnant” and nine months later would sprout fly agaric mushrooms, at the time of the autumn equinox. The story sometimes says that the fly agaric mushrooms grow from a mixture of the blood (red) and froth (white) of Wotan’s white horse. The wild hunt is drawn to the mushroom, calmed and put in a good mood with incense. In the smoke columns of the incense, and wherever it finds nourishment, the wild hunt army becomes guardian of house and farm. The ethnic cultures that live in the north of Kamchatka (a peninsula in the far northeast of Siberia), especially the Tschuktschen and Korjaken, live as reindeer nomads and wander with their flocks in the vast plains of that country. They and other north Siberian shamans ritually ingest the fly agaric mushroom, especially when they want to communicate with the souls of their ancestors or make contact with the spirits for divination and to heal the sick. The feeling of flying that occurs after consumption [of fly agaric mushrooms] is an effect that could be the origin of the Scandinavian and English version of Father Christmas, who flies through the air on his reindeer sleigh. The idea of a great variety of reindeer sleighs flying through the air at Christmastime seems to be pervasive. A laughing, red-and-white Father Christmas sits in his sleigh with his sack, his rod, and the presents. Every year this ancient shaman comes down to Earth in his reindeer sleigh and lands on numerous roofs--the very image of a great, twinkling, lit-up, Christmas decoration. Father Christmas is a pagan shaman from the grey mist of a distant European past. This might seem strange to a lot of people in our day; they may even think that this is an extremely far-fetched claim. Can you prove something like that? Siberian mythology describes a “heavenly hunt” in a manner similar to the Germanic wild hunt. The Siberian shamans ride on reindeer sleighs through the air, up to the clouds. The world tree is their goal; this is where the magic reindeer are. The Siberian Tschutschuken say that the moon is a man on a sleigh that is pulled by two reindeer to Earth and can fly back up to heaven--just like our Father Christmas (Guter 1978, 57ff). The association of reindeer and shamanism is ancient. In the caves of the Ardèche are wall paintings of reindeer that are around thirty thousand years old. As early as the Old Stone Age, reindeer were sunk in moors as sacrificial offerings--for example, in the Hamburg steppe of Meiendorf and Stellmoor and in Magdalénien (Pohlhausen 1953). This is the ritual context of cultic poles or stakes crowned with anthropomorphic mushrooms with dwarf caps. Sometimes, even reindeer skulls were placed on top of such sacrificial stakes. These often-neglected details may be early associations of the reindeer with the godly mushrooms, just as the mushroom-topped ritual poles may be early ancestors of the Christmas tree. So the red-and-white Father Christmas, riding on his reindeer sleigh through the air, clearly was nothing other than an anthropomorphic fly agaric mushroom or a fly agaric mushroom shaman.